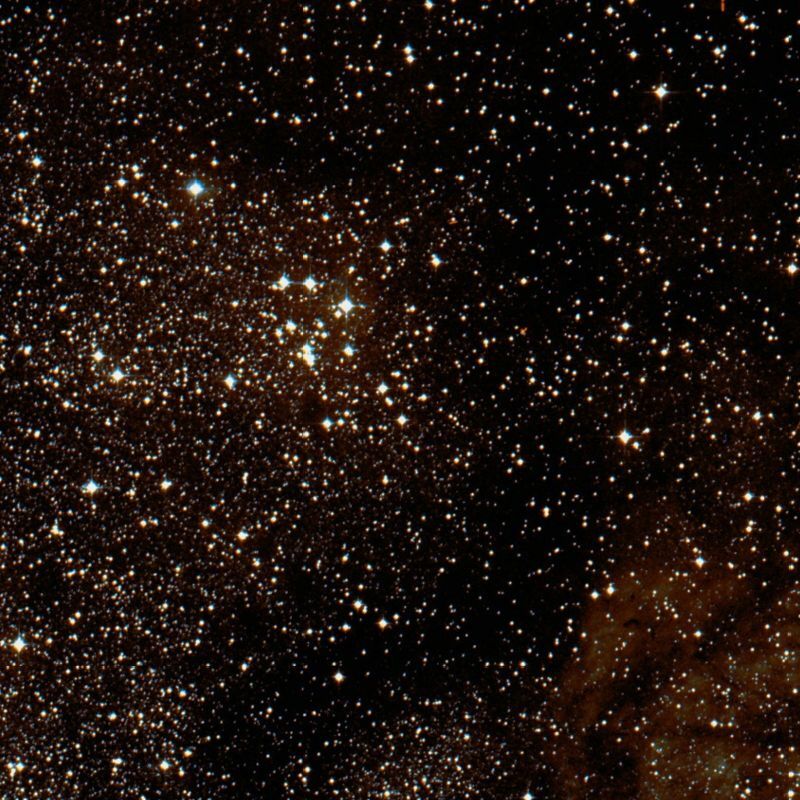 Messier 18 (M18) is a relatively dim open star cluster located in the constellation Sagittarius. 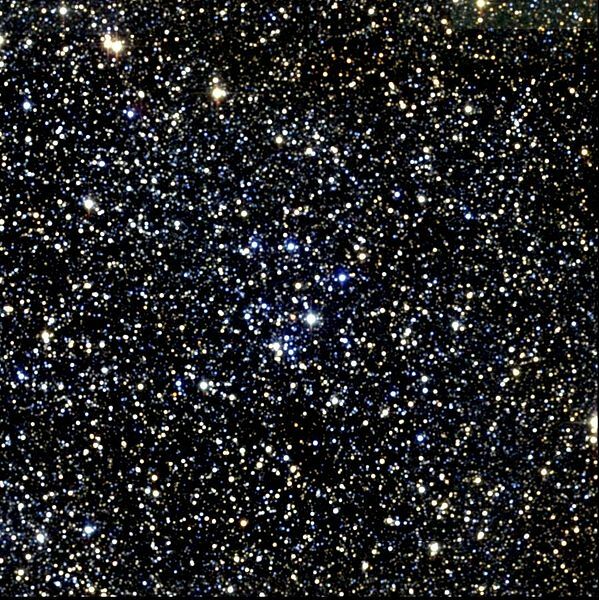 The cluster lies at an approximate distance of 4,900 light years, or 1,500 parsecs, from Earth and has an apparent magnitude of 7.5. Its designation in the New General Catalogue is NGC 6613. Messier 18 may form a binary star cluster with the nearby NGC 6618, embedded within Messier 17 (the Omega Nebula). Scientists have speculated that the proximity of the two clusters may suggest that they had formed together. Messier 18 is one of Charles Messier’s original discoveries. In the same night [June 3 to 4, 1764], I have discovered a bit below the nebula reported here above, a cluster of small stars, environed in a thin nebulosity; its extension may be 5 minutes of arc: its appearances are less sensible in an ordinary [non-achromatic] refractor of 3 feet & a half [FL] than that of the two preceding [M16 and M17]: with a modest refractor, this star cluster appears in the form of a nebula; but when employing a good instrument, as I have done, one sees well many of the small stars: after my observations I have determined its position: its right ascension is 271d 34′ 3″, & its declination 17d 13′ 14″ south. A neat double star, in a long and straggling assemblage of stars,below the Polish shield [Scutum]. A 9 and B 11 [mag], both blueish. This cluster was discovered by Messier in 1764, and registered as a mass of small starsappearing like a nebula in a 3 1/2-foot telescope; which affords another instance that the means of that very zealous observer did not quadrate with his diligence. The whole vicinity is, however, very rich, and there are several splendid fields about a degree to the south of this object. It was also [as M16] differentiated from Mu Sagittarii, for which it lies 4deg to the north-by-east, in the direction of Epsilon in the Eagle‘s tail. The cluster is estimated to be about 32 million years old, which makes it quite young. The hottest stars have the spectral classification B3. Most of the stars in M18 are quite small, but the cluster is also home to several bright blue, yellow and orange stars. It also contains a small amount of dust and nebulosity. Messier 18 is located between two other prominent Messier objects, Messier 17 (the Omega Nebula) and Messier 24 (the Sagittarius Star Cloud). It can be difficult to find because it is quite small, distant and invisible to the naked eye. Messier 18 is about 10 times more distant than the better known Messier 45 (the Pleiades), located in Taurus. 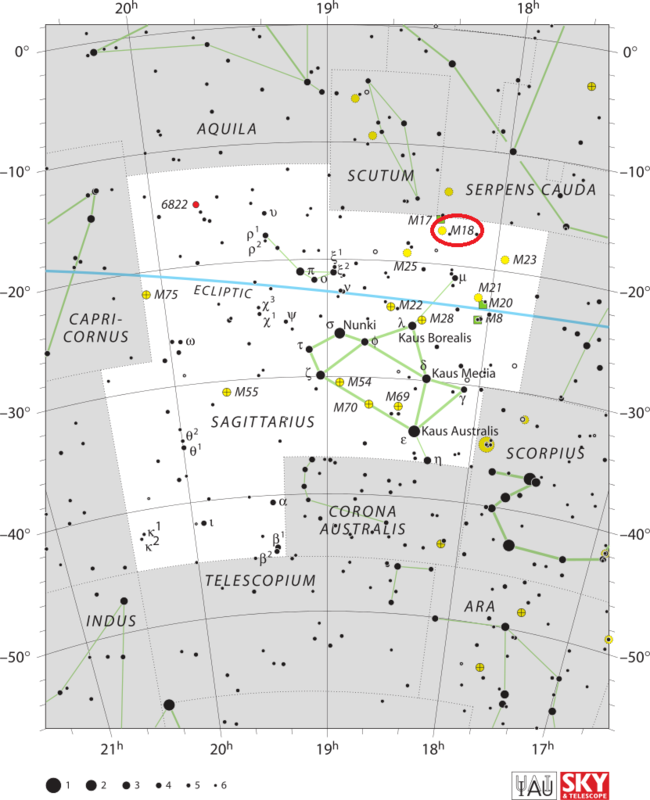 M18 is probably the hardest of the 11 Messier objects located in this area of the sky to find. The cluster lies against the backdrop of the galactic plane, which makes it even more challenging to locate and for astronomers to say with certainty how many stars it contains. The easiest way to find M18 with binoculars is to first locate Messier 17 and then aim slightly south, or to find Messier 24 and aim about two degrees north. The cluster is easy to resolve even in small telescopes and best seen with low magnification. Messier 18 can also be located using Kaus Borealis, Lambda Sagittarii, the top star of the Teapot asterism in Sagittarius. The cluster lies 8.5 degrees north and slightly west of the star. The star cluster is best to observe in small telescopes, which reveal just over a dozen relatively bright stars. Stars in the cluster are not very concentrated, so M18 doesn’t look as impressive in larger instruments. The cluster contains about 20 members. With a diameter of 0.2 degrees, it appears relatively loose and scarcely populated. The best time of year to observe Messier 18 is in the summer, when Sagittarius appears above the southern horizon in the evening. Open Cluster M18 (also known as Messier Object 18, Messier 18, M18, or NGC 6613) is an open cluster in the Sagittarius constellation. It was discovered by Charles Messier in 1764. 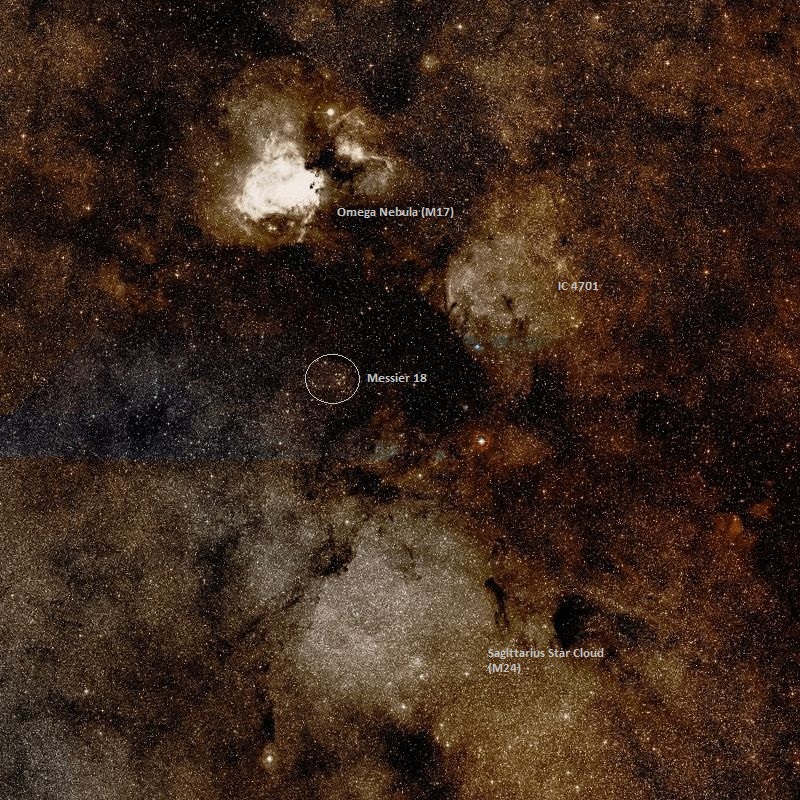 M18 is situated between the Omega Nebula M17 and the Star Cloud M24. Its age is estimated at 32 million years.